Nick Agouridis, a Greek immigrant who became a successful local businessman, died early Sunday morning at the Hospice and Community Care in Mount Joy. He was 83 years old. Nick was born in a small village on the island of Chios, Greece. The youngest of four children, he was raised by his sisters Maria and Angeliki, after his mother died when he was very young. As a young teenager, Nick traveled to the Greek mainland, where he worked in his uncle’s store. He joined the Greek Merchant Marines a few years later and traveled to India, Cuba, and other countries. While visiting his aunt Eleni Mountis in Lancaster in 1955, he met Koula Galanos, who later became his wife. Nick worked at his uncle’s Red Rose Restaurant in downtown Lancaster for several years, where he learned about business and discussed current affairs with many of the regular customers. 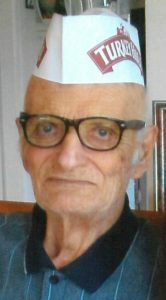 He taught himself to read and write English by studying the Wall Street journal in his spare time, and saved his money to open restaurants of his own, including the Tastee Freeze in Mount Joy, the Jumbo Restaurant in Landisville, and the Greek Gourmet and Ice Cream Works in Park City. For decades, he was a reliable presence at the Park City Food Court, where countless people would stop by to say hello and small children would have the special experience of making their very own ice cream cone behind the counter. Nick was especially proud of the four massive fig trees in his back yard which grew from cuttings that he brought from Greece. For Nick, the annual harvest every August came to symbolize the many wonderful opportunities that his life in America provided to him, and he shared buckets of figs with neighbors, friends, and restaurant customers. Nick’s passion for learning and his entrepreneurial spirit exemplify the American dream. He was committed to duty and the country that he came to love. Because he experienced famine as a small boy in Greece, he developed a strong commitment to helping his local community. For years, his restaurants provided jobs for the hundreds of people whom he employed. The Mount Joy Jaycees honored him with a community service award. Nick was a devout member of the Annunciation Greek Orthodox Church in Lancaster. He is survived by Koula, his devoted wife of 63 years, his daughters Leona and Despina, and three grandchildren, Nick, Elena, and Alexis. 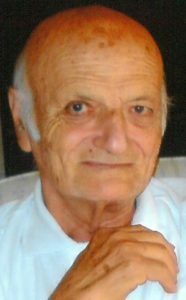 A viewing will be held from 9-10:30 AM on Wednesday, December 5, 2018 at Annunciation Greek Orthodox Church, 64 Hershey Ave, Lancaster, PA 17603. A Funeral Service will begin at 10:30 AM officiated by Rev. Hector Firoglanis. Nick will be laid to rest at Conestoga Memorial Park. Many fond memories at the Jumbo in Landisville. Nick was always so cheerful. He expanded my world. Koula, we are so sorry to hear that Nick has passed. You and your family have our sympathies at this sad time. He lived a wonderful life and accomplished so much! It was a joy to learn it all from his obituary. I am so sorry to hear this news. I worked at Jumbo restaurant in the early 70s. Nick was so patient with me during that time and I gained from him skills and attitudes that have carried me through life. I remember once dressing up in a chicken outfit for a promotion at the Tastee-Freeze. My condolences to Koula, Leona, Despina and the rest of the family. Koula, I am so sorry for your loss. After working in CVS at Landisville as your pharmacist, I came to know both of you and know you were devoted to each other. Such a blessing. My prayers are with you. I SHARE IN YOUR GRIEF AT THE PASSING OF A WARM, KIND HUSBAND, FATHER AND GRANDFATHER. THANK YOU FOR YESTERDAY’S EARLY PHONE CALL; I’M SORRY I WAS NOT ABLE TO ATTEND THE MORNING VIEWING TO PERSONALLY CONVEY THIS SYMPATHY. koala..Remember working with you at Lancaster Hospital, years ago. My name is Dorothy . We knew then what special people you 2 were. You talked about having kids but your girls were not born yet. We went to the restaurant after work and Nick gave us food. Such giving people with a special heart reaching out to others. Thoughts and prayers to your family.! I thought of u thru the yrs. you were a dear friend and quite special! To Koula and Nick’s daughters. I am sadden at the lost of this dear man. Nick was very kind to me as a young single mother and I gained his trust and became his mobile home manager for many years. His kindness will never be forgotten as well as yours also Koula. Our thoughts and prayers are with you at this sad time. May Nick rest well. Sorry, we could not be with you to participate in his remembrance. I send you my sincere condolences for your loss of such a wonderful man. He was an honorable person and truely humble. Now he is enjoying God’s glory and remains an example to all of us still waiting to enter His kingdom. He will surely be missed. May his memory be eternal. To the Agouridis family my deepest sympathy. Once may neighbor then my friend in Landisville, Nick would share and teach me about his fig trees. I reaped the benefits of there fruit. We shared different tomatoes and discussed gardening strategies. I never will regret stopping on my walk or stopping my yard work while Nick walked to have a good conversation. Nick is beign showerd in gods love and glory but will be missed. Prayers to you Koula. Thanks for the great moments and memories Nick. We were so sorry to hear of Nick’s passing. May his memory be eternal. I first met Nikos Agouridis at my aunt Tessy Frangakis’ house when I immigrated to Lancaster from Greece back in the 70s. He was one of the rarest people I came to know in Lancaster, not only for his entrepreneurial astuteness but mainly for his kind heart, genuine goodness and modesty. My family and I extend our deepest sympathy to Koula, Leona, Despoina and all other relatives and friends. I was so sorry to hear Nick past away. He was a wonderful boss when I worked for him at the Jumbo restaurant. I especially remember during the TMI accident in 1979 when I was a scared pregnant woman. He told me to leave the area with my husband and he would help me in whatever way he could. May God be with you, Koula and girls; he was a very special man. You have my sincere sympathy on the passing of Nick Agouridis. I did not personally know Mr. Agouridis, but remember him from Park City’s food court. Always a friendly face. I enjoyed reading about his life in the obituary. (My deceased grandfather, Gust Dimitris, immigrated from Greece as well.) May God bless you during this time of grieving. So sorry for your loss, it’s clear your dad was a special individual. My daughter worked for “Uncle Nick” as he was fondly known by many, myself included. Nick was a very kind man who loved his employees & his customers. It was always a joy to see him at the Ice Cream Works & when I saw him sitying at a table with his friends in the mall. He always asked about my daughter. Nick was a wonderful person. I knew Nick from working as a secretary at Century 21 Hotter and Associates, where Nick hung his realtor license. He was such a gentleman, and a joy to work with. so sorry to see this. my deepest sympathy to his family. Nick was a very special man. Jumbo was a special place in Landisville. I was fortunate enough to know Nick casually when he took his daily walks in our neighborhood. He welcomed us to his home and we were encouraged to pick figs from his beloved tree whenever we wanted. He was a good man and extremely dedicated to his community and family. I missed seeing him when he moved out of Landisville. May he rest in peace. I worked for Nick at the Mount Joy Tastee-Freeze while in High School in the early 80’s. Nick was such a nice and caring person. On top of that I never seen him get angry or flustered even while dealing with many teenage employees. I always enjoyed at the end of the night if things would slow down when he would talk about where he was from and his adventures. My condolences to Koula and the rest of the family.